Look and feel good with the newest Amazfit Verge Fitness Tracking Smartwatch. This attractive timepiece offers the ideal combination of technology and style. Designed for fitness enthusiasts with an eye for fashion, the Amazfit Verge tracks 11 sports including walking, running, tennis, climbing, cycling, skiing and elliptical training. In addition, it comes with GPS + GLONASS, making it easy to track distances traveled and routes accurately. Likewise, the optical sensor monitors and records your heart rate. The Amazfit Verge also enables you to check your text messages, emails, and other app notifications without taking your phone. In fact, you can even answer incoming calls directly on your wrist via a Bluetooth connection. To keep up with your active regime, the smartwatch provides an impressive five-day battery life. Available in three designer colors, the Amazfit Verge is the ultimate companion for any occasion. Even with all of that tech crammed inside the Amazfit Verge, Huami is still promising around 5-days of battery life on a single charge. If you’re interested, the Amazfit Verge is available for purchase now at both Tmall and JD for CNY 800 ($115 USD). 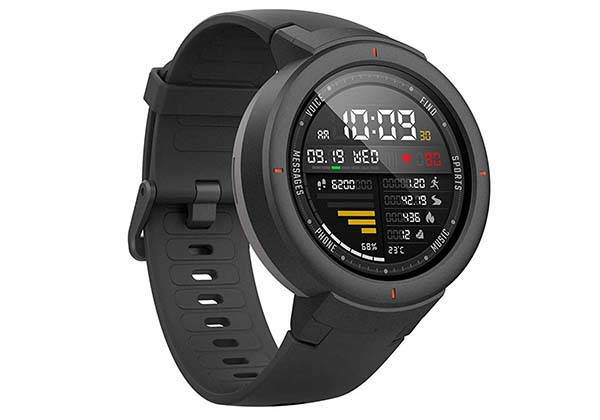 Huami’s previous smartwatch, the Amazfit Bip, did eventually make its way to the United States, but it’s currently unclear if the Verge will follow in those footsteps.